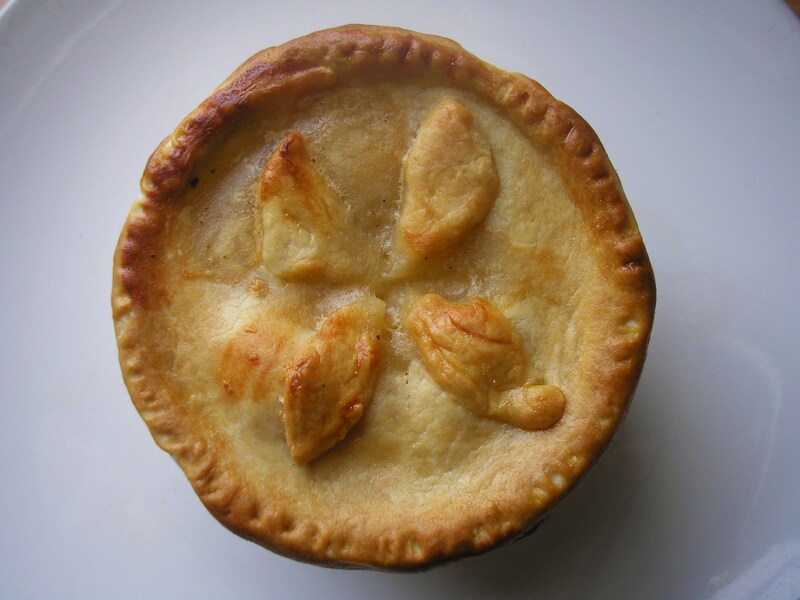 Throughout his childhood, whenever my son was asked what he would like for dinner, his choice would almost always be Chicken and Leek Pie. Not Chicken and Mushroom, not Chicken and Vegetables, it had to be Chicken and Leek. The mild onion flavour of the leek, combined with the chicken and a creamy white sauce, all steaming hot in a crisp butter pastry crust is, I’ll agree, a delicious combination. These days, thankfully, his palate has matured and he is a little more adventurous though he still loves his Chicken and Leek Pie. Now that he (occasionally) cooks for himself he has also realised how easy it is to make. Here’s the recipe. For the pastry: Sift flour, add salt, rub in the butter lightly with the tips of the fingers until the mixture resembles breadcrumbs. Make a well in the center and add water. Bring together to form a firm dough leaving the sides of the bowl clean. Refrigerate for 30 mins. Roll 2/3 of the pastry out and line the bottom of a pie or flan dish. Blind bake on the middle shelf of a 200 c oven for 15-20 mins. Remove and allow to cool. Roll out remaining piece of pastry and set aside for the top of the pie. For the filling: Melt butter in a pan until bubbling, add leeks. Fry until translucent. Add chicken, dried herbs and spices, toss for 1-2 mins. Reduce heat, sprinkle flour over the chicken, cook off flour for 1-2 mins. without browning Gradually start adding milk, stirring all the time, then add chicken stock. Stir through Dijon mustard. Simmer for five minutes or until sauce has thickened. Season to taste. Allow to cool. Fill pie crust with the chicken mixture. Cover with pastry top and glaze with egg wash (1 egg whisked with a little milk). Cook in a 220 c oven for 15 mins. Turn and reduce heat to 180 c. Cook for a further 30-45 mins or until the crust is golden brown. It is all right to use frozen pastry sheets if you are pressed for time, the result is still pretty good. 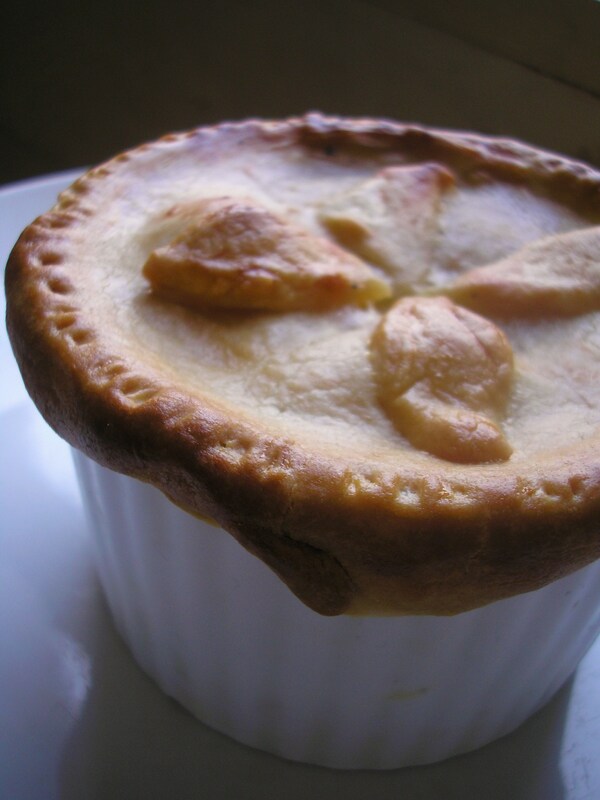 You can also make little individual pies in ramekins with pastry just on the top. With the cold weather we have been experiencing lately the people in our house were craving something warm and comforting. No-one wanted meat so a bouef bourguignon was out of the question. Soup was a possibility but we couldn’t agree on a particular recipe as we all have our own favourites. I suggested Spinach and Ricotta Lasagne (a recipe I have been making for more years than I care to remember) and finally a consensus was reached. 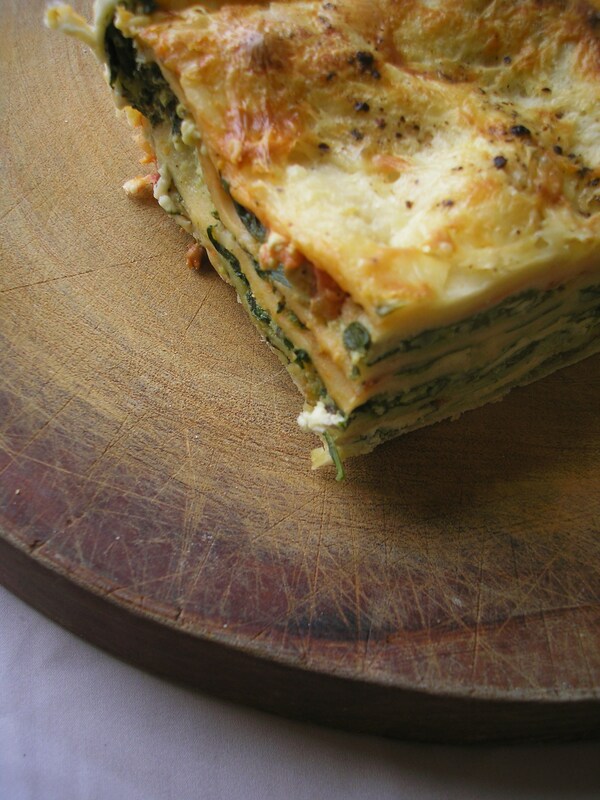 Lasagne is great for cold days as it is very satisfying, it is also good when you want to feed a lot of people with a minimum of effort as it can be made ahead of time and shoved in the oven when needed. I prefer to make my own lasagne sheets but it is acceptable to use the commercial variety if you are pressed for time. For the pasta: Mound flour on a clean work surface. Add salt. Make a well in the center. In the well place the three eggs and the oil. Bring the flour into the middle with your hands and work the mixture until you have a firm dough. Knead for 5-10 mins. or until smooth. Wrap in cling film and rest at room temperature for 20 mins. Divide dough into thirds. Roll each piece out to a large sheet about 2-3 mm thick. Hang sheets over a clean towel rail or clothing rack for 15-20 mins to dry. Cut to required size. For the filling: Fry onion and garlic in a little olive oil until translucent, add dried herbs and cook for a further 30 seconds. Set aside. 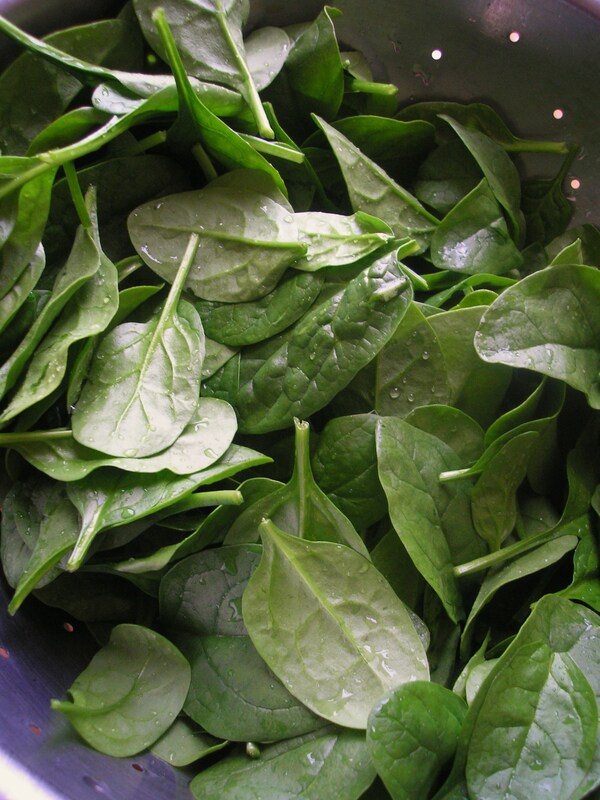 Shred spinach leaves and place in a bowl with the ricotta, Parmesan, all spice, nutmeg, egg and seasoning. Add cooked onion and garlic and mix thoroughly. Set aside. For the bechamel sauce: Melt butter in a saucepan. Add flour and cook for a couple of mins. to get rid of the floury taste. Gradually add the milk, stirring all the time, until all the milk is used up and you have a smooth sauce. Add bay leaf, nutmeg and seasoning. Set aside. Put a little of the diced tomatoes and 2 tbs water in the bottom of a lasagne dish. 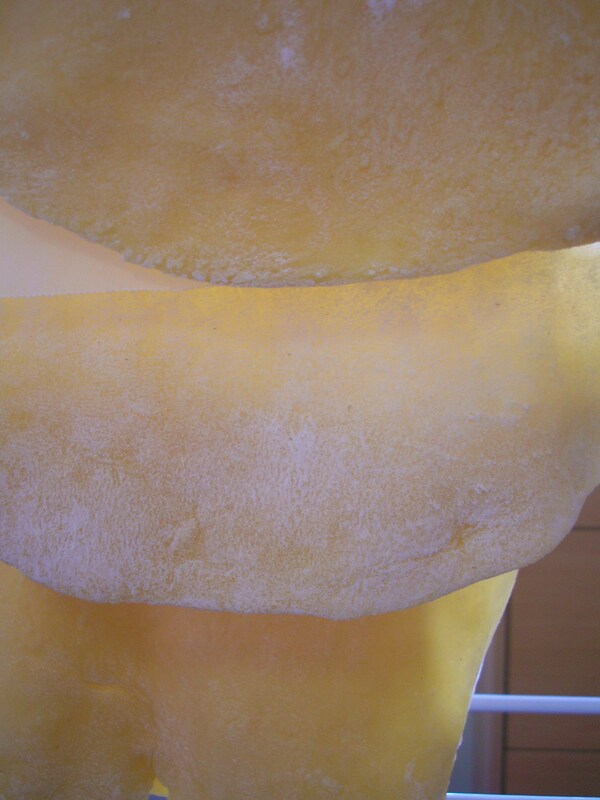 Cover with a layer of pasta. Spread about 1/4 of the ricotta mixture on top, sprinkle with some more of the diced tomatoes and a little of the bechamel sauce making sure you keep about 1/2 to cover the top. Repeat with the remaining layers finishing with a layer of pasta. Cover with bechamel sauce and extra freshly grated Parmesan cheese. Cover with foil and place in a pre-heated 180 c oven for 30 mins. Remove foil and bake for another 30 mins. or until golden brown. I have been reading Salt: a World History by Mark Kurlansky. Though you may think a history of salt doesn’t sound very exciting it was (surprisingly) compelling. I didn’t realise how many settlements had been settled, fortunes made and lost, wars fought – over plain old salt. The fact that everyone needed salt, for their health, to add flavour to cooking, for preservation in the times before canning and refrigeration, for vital chemical processes (one of the earliest being the dyeing of fabric), meant that that the person or administration that controlled the local salt trade, quickly became very rich indeed. The ruling elite soon realised that there were other ways to make money out of salt – some of the first taxes ever imposed were salt taxes. Of course, everybody had to pay them because, rich or poor, they all needed salt, making these taxes popular with despots and tyrants and extremely unpopular with the masses. It was early in the piece that humans discovered a natural affinity between salt and the fishing industry. In Roman times salt fish or salsamentum were already established as a lucrative trade item. The innards and the scraps left over from the salt fish industry were placed in earthern jars with salt to produce the Roman condiment garum. Even earlier than the Romans, the Chinese were also making a fermented fish sauce called jiang. This, with the addition of soybeans and the removal of the fish from the recipe, eventually became soy sauce. Fish sauce is, however, still widely used today throughout South East Asia. In Vietnam, instead of adding salt directly, the cook will often use fish sauce or nuoc mam to provide seasoning. This is similar to the way Chinese cooks add soy sauce to their dishes. Fish sauce is also widely used in Vietnam as a component of dipping sauces – these are served with almost every meal. 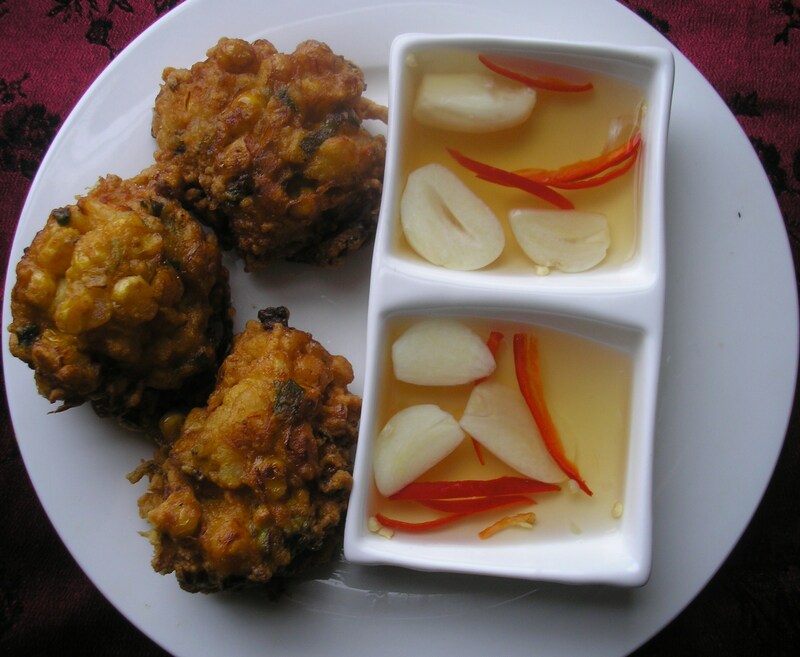 Here is a recipe for dipping sauce that I found in Luke Nguyen”s book, Songs of Sapa. Mix the fish sauce, rice wine vinegar, sugar and 125 ml water in a small saucepan and place over medium heat. Stir well and cook until just below boiling point. Remove from heat and allow to cool. To serve, add garlic, chilli and lime juice. Will store for up to 5 days in a tightly sealed jar in the refrigerator. 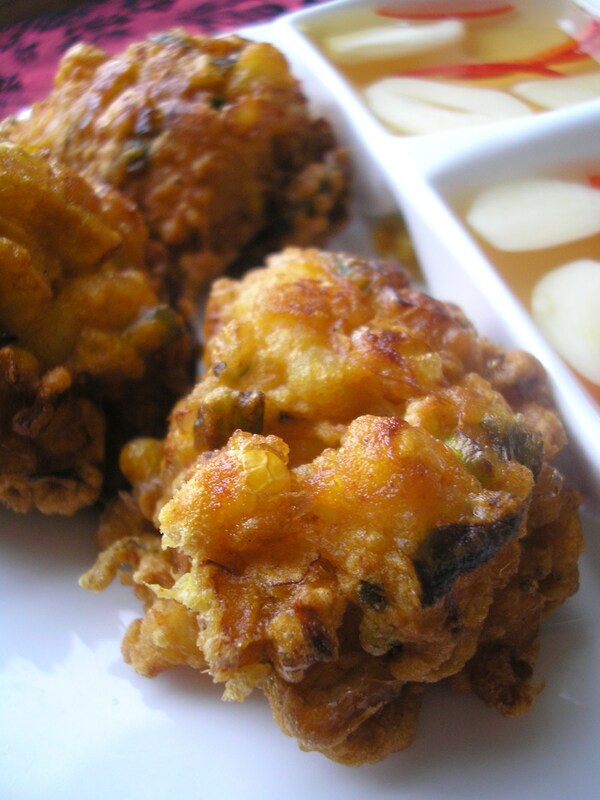 I served mine with another of Luke Nguyen’s recipes, Prawn and Corn Fritters. Combine the flour, paprika and turmeric, mix well. Place the chopped prawns in a large bowl, season with 1/2 tsp each of salt and freshly ground black pepper. Add the corn kernels, spring onions, garlic, shallots and eggs. Mix to coat the prawns, then gradually add the flour, mixing until well combined. The mixture will be very thick. Heat the vegetable oil in a wok to 180 c or until bubbles form around the handle of a wooden spoon inserted into the oil. Shape the batter with two spoons or with your wet hands into small patties. Drop into the hot oil and fry for 3-4 mins or until crisp and brown. Remove and drain on a rack, serve immediately.